Drumroll, please…. I am thrilled to share the cover for my new chapbook of literary & speculative short fiction, Enduring Spirit! In it, readers will befriend resilient girls, women & ghosts. From women discovering disquieting crimes, to literary glimpses of families changing, to ghostly sisters holding their own, the stories will intrigue & move you. I am so grateful to Spider Road Press’ talented cover design consultant, Heidi Dorey. 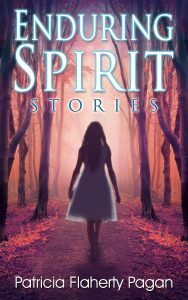 Enjoy the cover and get your copy of Enduring Spirit from Spider Road Press this May! Posted in Uncategorized and tagged book cover, book launch, books, cover reveal, fiction, short stories.